Niccolo Paganini was a Romantic Italian virtuoso violinist and composer. He was probably the most celebrated violinist of his time, and still today is considered one of the greatest, if not the greatest, violinists ever. While being known for and beloved for his amazing virtuosity on the violin, he also had some great compositions involving the violin. Paganini was not a prolific composer, but had some important and great works. His 24 caprices for solo violin are in the form of etudes [studies] that many young people today use today for practice of their fundamental violin technique. 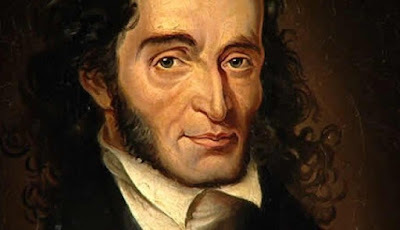 From the Paganini web site, Paganini composed 12 sonatas for violin and guitar; 6 violin concerti; and 6 quartets for violin, viola, cello, and guitar. I have called Frederic Chopin, Mr. Piano, for being one of the greatest pianist of all time and for his so many beautiful compositions, that were almost all exclusively for solo piano. I think in that same vein we can call Paganini, Mr. Violin, for being one of the greatest virtuoso violinists of all time and for his great compositions [although not prolific like Chopin was for the piano] for the violin. When listening to my local classical music station here in Houston, KUHA, I learned something I didn't know about Paganini. As a youngster he loved the guitar and became a virtuoso on the guitar and wrote compositions for that instrument. In fact, Niccolo Paganini often used the guitar [instead of the traditional use of the piano] in aiding his compositions for the violin. KUHA then played Paganini's Grande Sonata for guitar that I really enjoyed. This sonata is in A-Major with three movements: 1. Allegro Risoluto; 2. Romance; and 3. Andantino variato. I have the Allegro Risoluto movement here thanks to Wagner Rodrigues for this video on You Tube featuring Ana Vidovic on guitar. Then watch the amazing technical wizardry it takes to play Paganini's Caprice #1. Remember these caprices are in the form of etudes, for students of the violin to practice for their technical skills. Just imagine yourself a young violin student and your teacher telling you to practice this every day. :-) Thanks to this You Tube from ciabonel. As difficult as that may be, Paganini's final Caprice #24 in A-minor is considered one of the most difficult pieces ever written for the solo violin. it is in the form of theme and variations which includes 11 variations on the original theme. Note: Thanks to Cleberson Carvalho on You Tube for this wonderful video of the great virtuoso Hilary Hahn on violin. And finally, enjoy Paganini's famous "La Campanella" a showpiece that sometimes is played as a stand alone piece or as an encore by the violinist after a concerto. It is the rondo final movement of his second violin concerto in B minor. Virtuoso violinist Sayaka Shoji is the soloist. Please turn up the volume and enjoy some great music for the violin [and one for guitar] by "Mr. Violin", Niccolo Paganini.